Lemon Grass is a culinary and traditional medicinal grass. The leaves and stems are used in cooking and for making herbal tea. Plants grow to a height of about 1.2m with arching, blue-green lemon-scented leaves. There are flowers in summer. Lemon Grass can be grown in pots or directly in the garden. They grow best in sun to part shade and most well drained soils. The plants are killed by frost, so they can be grown as annuals or grow in pots and protect from frosts over winter or brought indoors. Pack of approx 1000 seeds. 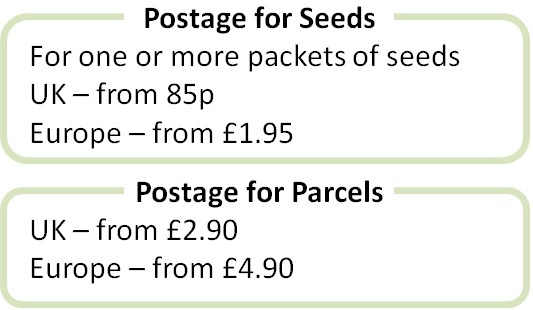 Sow the seeds anytime or in spring if growing as an annual. Germination can be erratic, so sow more seeds than you need. Sowing instructions and a colour photo are printed on the packet. Conditions Grow in sun to part shade and poor to rich well-drained soil. For indoor cultivation: Sow the seeds year-round on the surface of moist seed compost in trays or pots. Press these small seeds lightly into the cost and keep at a warm 20-25°C. Germination takes 3-6 weeks. Germination can be erratic, so sow more seeds than you need. Make sure indoor plants have enough light. For outdoor cultivation: Sow seeds in a tray in spring and plant out after the last frost into the garden or into a container. Plants grow well once established. They are evergreen and do not need much maintenance other than removing dead leaves as necessary and dividing plants about every three years. The tops of the leaves can be trimmed once the plants have reached about 30cm in height and used to make herbal tea. The stalks can be snapped off at the base of the plant once they are bigger than 5mm across. The lower third of the stalk is edible once the woody outer leaves are removed. Stems can be crushed or ground up for cooking. They can be frozen for about six months.